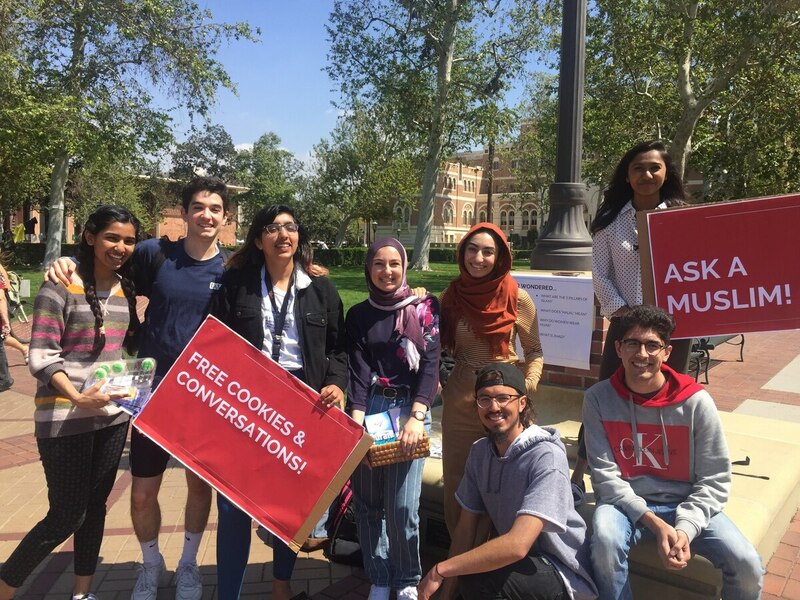 Muslim students held an “Ask a Muslim” event on Trousdale Parkway to encourage meaningful conversation. Members of the Muslim Student Union held signs that read "Ask a Muslim" and "Free Cookies & Conversations" on Trousdale Parkway Wednesday. The event was a part of Islam Awareness Week, an annual initiative hosted by MSU. The table was an effort to reach out to the USC students and address community concerns following the mass shooting in Christchurch, New Zealand that took the lives of 50 people in two mosques on Mar. 15. Last week, MSU co-hosted an interfaith vigil to memorialize the victims of the shooting. "The aftershocks of the event can be felt around the world. Acts of violence and hate are never committed in isolation. We must remember to stand together in solidarity," MSU's Facebook page read. The organization hosted several events throughout the week, including dinners, communal prayers, an Islamic Art Show and Friday prayer and movie night. MSU created the "Ask a Muslim" table to establish a space for the University community to ask questions about misconceptions and genuine curiosities regarding the Islamic faith. Zaynab Zia, a junior majoring in business administration and an MSU member, said the week was important to host following the mass shooting. "I think it was really important to have Islam Awareness Week in general and it happened to be around the same time as that really unfortunate incident," Zia said. "I'm really glad that many students on USC's campus — many students who are non-Muslim and Muslim — are coming out and reaching out for support because of what happened. According to Zia, there is a large Muslim student population at USC. Hala Ozgur, a freshman majoring in journalism, said the "Ask a Muslim" event was meant to promote awareness, unity and understanding of the Islamic faith on campus. "The point of all of this is to bring awareness, and to have people asking," Ozgur said. "That's what we really want — at the end of this week, if people learn anything, it's that we are approachable, we are normal people and we want to educate you about Islam." Ozgur said that as a Muslim woman who wears a hijab, she is often faced with questions from those around her. "It's very outwardly apparent that I'm Muslim and that could be good or bad depending on how people perceive that," Ozgur said. "In my experience, I receive questions pretty often … like, 'Why do you wear the hijab? Is that a fashion statement? Is that a towel? Is it a hat?'" Ozgur said though other people may find certain questions offensive, she appreciates any opportunity to educate others regarding her faith and customs. "I don't care what the question is. If it gives me an opportunity to educate you and explain to you what it really is, that's all I want," Ozgur said. "Even if you don't agree with me, that's okay. The very fact that I am able to have a conversation with you means more to me." Irem Onalan, a junior majoring in chemistry and an MSU member, said this week has sparked a lot of important conversations among the student body regarding faith and tolerance. It has also deeply united USC's Muslim community. "I love how this week has created important conversations between Muslims and non-Muslims on campus, but it has also brought the Muslim community on campus closer together," Onalan said. "It is really nice to have events everyday that we can go to, organize together and start conversations with other people." Zia said that those genuinely interested in learning more about Islam and the Muslim community are welcome to reach out at any time. "[It] warms my heart to know that people want to learn more and celebrate diversity, and that is what makes this week worth it, to see that people are supporting us," Zia said.